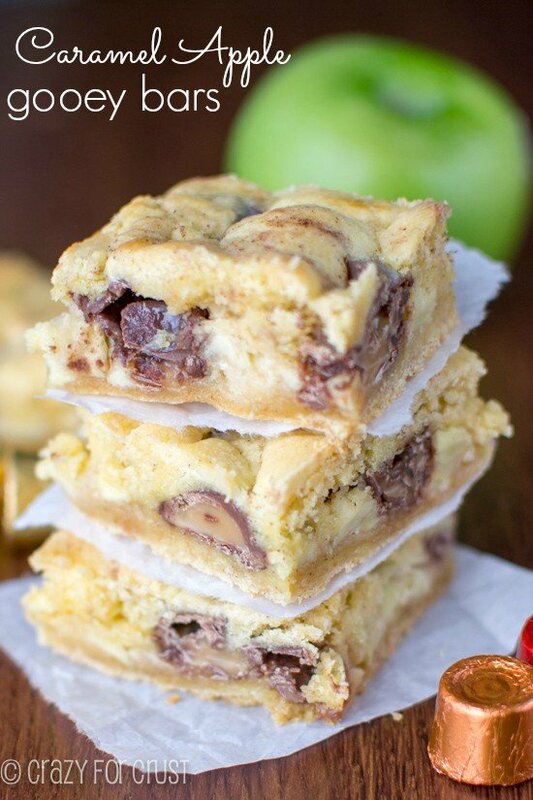 These Caramel Apple Gooey bars are one of my favorite versions yet: cake mix gooey bars are full of Rolos candy and apples for the perfect fall recipe. Okay, yes. I know I have a problem. A gooey bar problem. And, well, you know me. When I find something I like, I buy 7. 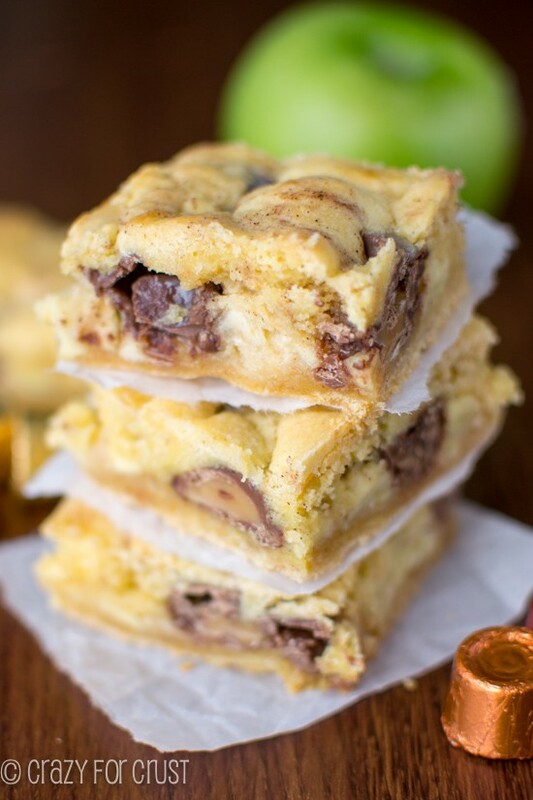 So…more gooey bars for you! But that’s not a problem, right? YOU like gooey bars as much as I do! 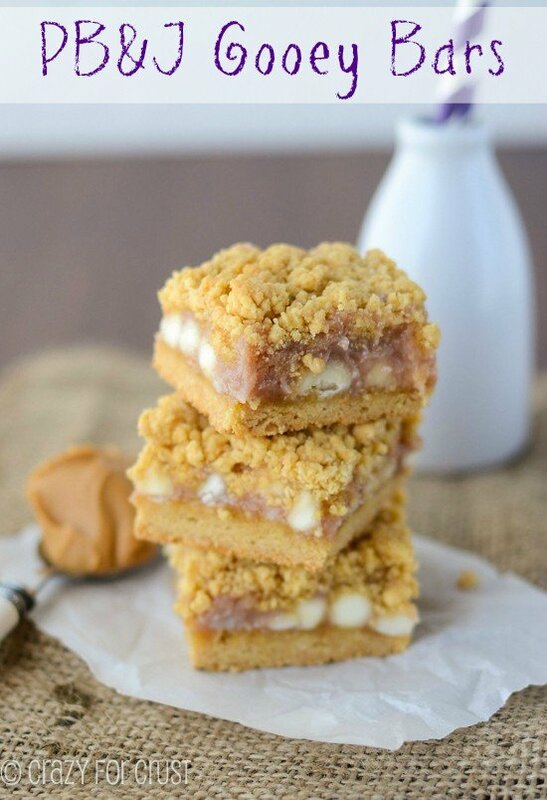 And you’re gonna love these Caramel Apple Gooey Bars! I seriously can’t stop thinking of combos. I mean, stand in the candy aisle at Walmart for a minute and just imagine. Rolos. That’s what spawned these. Rolos are amazing – caramel and chocolate. Two things that go so well with apple. 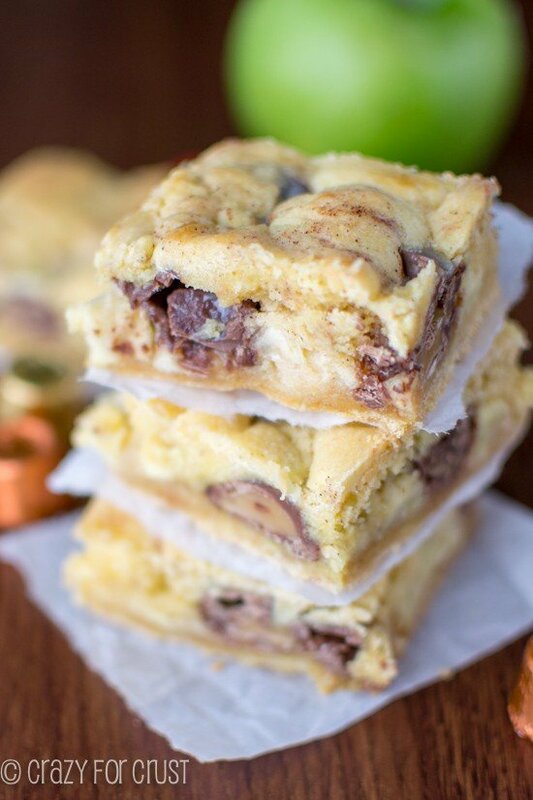 Caramel Apple Gooey Bars combine Rolos with apples and cake mix to make the perfect fall gooey bar recipe! These bars, as usual, start with a cake mix. I used a yellow cake mix. (I’m partial to Duncan Hines.) You make a dough out of it, and press half into the pan. Then you spread apples and Rolos on top. And give those a bath in sweetened condensed milk. Topped with the rest of the cake mix dough, you bake and then swoon in delight. Apples + Caramel + Chocolate = Good. A note about the recipe: I didn’t pre-cook my apples, so they’re a little chewy. I wanted them that way in this. If you can’t stand that, then pre-cook them. It won’t affect the rest of the recipe, and I’ve made a note in the recipe itself. 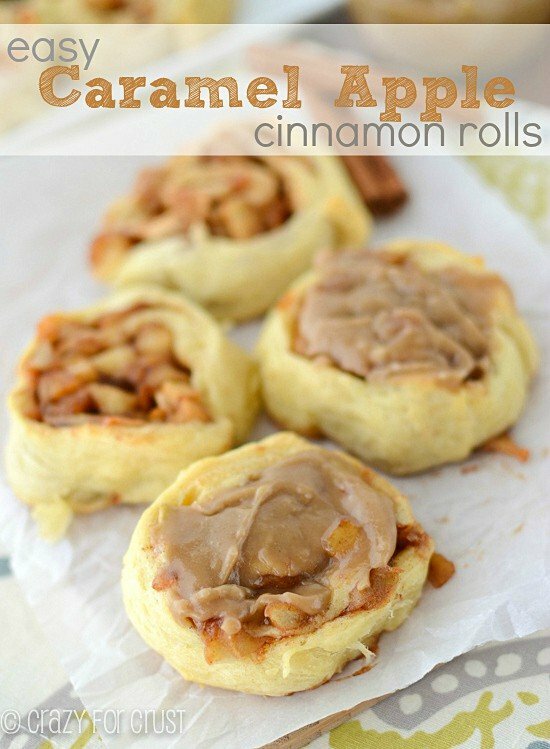 Either way – these are the perfect way to use up those apples from the orchard. And the perfect excuse to buy Rolos. Not that you really need an excuse. Those suckers are good! Preheat oven to 350F. Line a 9x9” pan with foil and spray with cooking spray. Mix cake mix, egg, butter, and cinnamon in a stand mixer fitted with the paddle attachment. The dough will form a ball. Press about half of the dough in the bottom of the pan. Top with diced apples and Rolos. Pour the sweetened condensed milk evenly over the top. Place bits of the remaining dough evenly over the top and press gently to compact. Bake bars for about 35 minutes, until the top just begins to brown. Remove from oven and cool completely before slicing. The refrigerator helps this step, but be sure to serve room temperature so no one breaks a tooth on a cold Rolo! Click here to see my best Cake Mix recipes! I wanted to tell you that you’ve made addicts of my children with this recipe! My five year old is devastated that I don’t intend to make more until next week when his grandma comes and my two year old started crying when I told her they’re all gone. Thank you! This recipe is amazing!! LOL!! Thank you so much Allysia! I’m glad she likes them!! Can I double this recipe and put in a 9×13 pan? Yes, but it will be thicker than the bars you see, since a 9×13 is not quite double a 9×9. Baking time might be affected, but it’ll still be amazing! 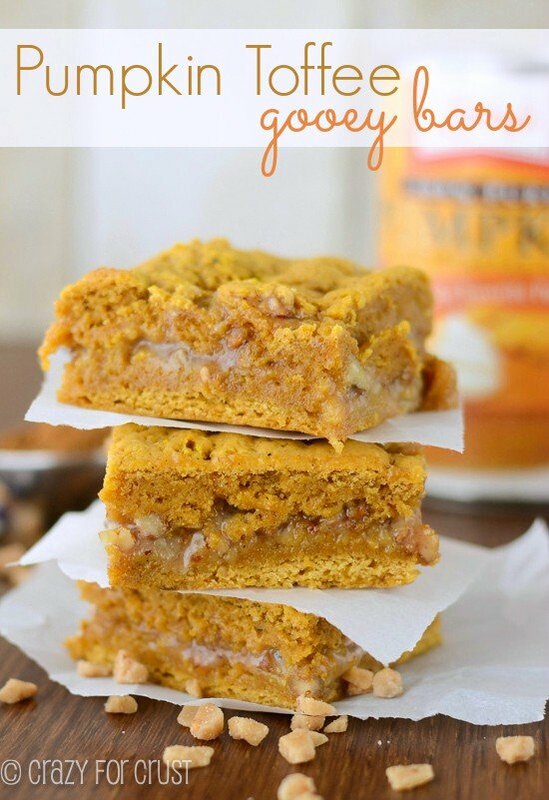 those gooey apple caramel bars…can a person use caramel topping instead of rolls…and how much. Would like to make soon. Please let me know. Again thank you ! Hi Pat! Unfortunately, no, you shouldn’t use liquid caramel topping in place of the Rolos. You could use caramel candies (any kind, the Kraft caramels or Hershey’s Caramel Kisses, etc) in place of the Rolos. If you want to use caramel sauce, you can try using it in place of the sweetened condensed milk but I don’t think that will work – instead I’d get that new caramel sweetened condensed milk that Eagle brand just released!